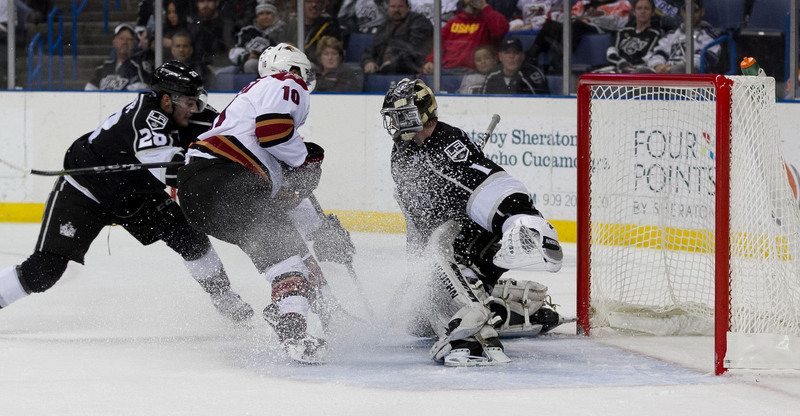 Hampered by a second period in which four goals were surrendered, the Roadrunners fell to the Ontario Reign by a 6-4 score Friday night at Citizens Business Bank Arena. It proved to be the team’s first loss on the road since December 9; their five-game win streak in opposing buildings snapped. Ontario struck for the evening’s first goal just 1:24 into the game. The Roadrunners responded for two goals later in the opening frame that were produced by bouts of fantastic passing. Tye McGinn tied the game 1-1 at the 9:33 mark of the first, skating into a gorgeous Mario Kempe feed, beating Ontario’s Jack Campbell as he fled toward the net with a full round of momentum. McGinn’s goal, his fifth of the season, was also his eighth point (3G, 5A) against the Reign this year. Four minutes later, and in finishing a fantastic sequence of transition, Laurent Dauphin fed Nick Merkley, who stuffed his team-leading 18th goal of the season past Campbell to give the Roadrunners a 2-1 lead. Ontario went haywire for four unanswered goals in the second. Hunter Miska was pulled following the Reign’s third goal of the evening. He stopped 15 of the 18 shots he faced in 25:58 minutes of action. 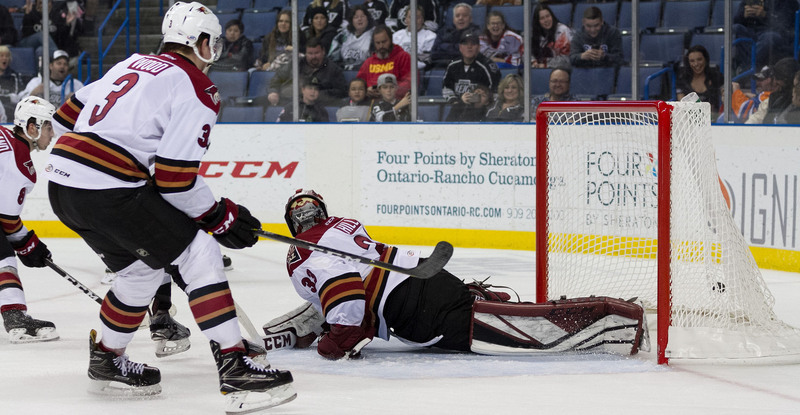 Mario Kempe gave the Roadrunners a new lease on life in the opening moments of the third when he touched a Jens Looke pass past Campbell to cut Ontario’s lead to 5-3. With 8:40 left to play, Andrew Campbell got the Roadrunners to within one when he walked into a Conor Garland pass, firing a slapshot that found its way into the net for his second goal of the season. Ontario’s Phillipe Maillet gave the Reign a 6-4 lead with 6:07 left to play, the night’s eventual final score. Adin Hill stopped 16 of the 19 shots he faced in relief of Hunter Miska. Nick Merkley did not play in the third period after taking a rather heavy hit from Alex Lintuniemi late in the second. With the loss, the team’s record falls to 18-11-2-1, but their .609 win percentage is still situates them at first place in the Pacific Division. The Roadrunners' three-game road trip will be completed Saturday night when the team takes on the San Diego Gulls at the Valley View Casino Center, where the puck is scheduled to drop just after 8:00 PM MST.